Everest Base Camp is a popular trekking destination for travelers from around the world. It lies in the most iconic Sagarmatha region of Nepal. The distance covered during the Everest Base Camp Trek depends upon the route you want to take during this trek. During the Everest Base Camp Trek, you will hike the diverse terrain in the foothills of the Himalayas. The conventional Everest Base Camp trek covers a round trip distance of 130km. However, the distances during the other Everest Base Camp Treks are different. Your journey begins with an exotic flight to one of the most thrilling airports of the World. Luka airport will live up to its reputation and surely give you the adrenaline rush during the landing. From Lukla, you will embark on an incredible trip and follow the footsteps of brave men like Sir Edmund Hillary and Tenzing Norgay. On other treks such as the Jiri to Everest Base Camp Trek, you will drive to Jiri and start your trek from there. So there will be 3 or 4 additional days you will have to spend trekking during the Jiri to Everest Base Camp Trek. So the distance during the Jiri to Everest Base Camp trek is longer than the regular Everest Base Camp Trek. 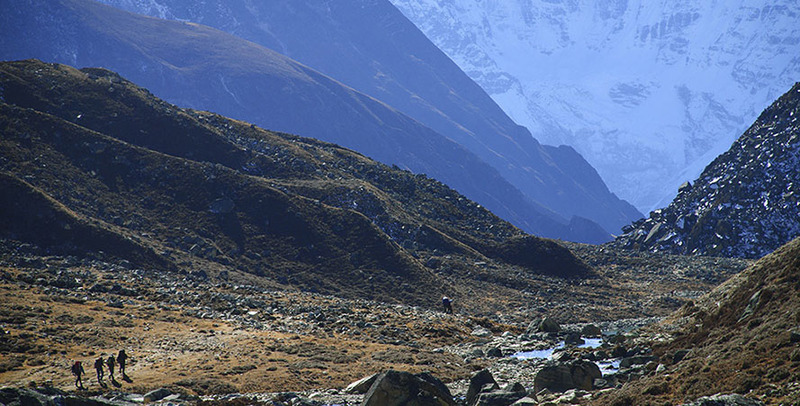 You will walk on the long routes through the fascinating and staggering Sagarmatha National Park. The hike is an indescribable experience to Everest Base Camp. You will enjoy the wondrous buzz and excitement with your fellow travelers and summiteers along the way. You will have the experience to experience profound nature at it’s finest. The expedition to the Everest Base Camp takes you to the overwhelming rivers, mere streams, and dazzling Mount Everest 8848 m. The trekking experience can be strenuous because of the walking distance and the awkward distance involved. Sometimes, trekkers also want to visit the wonderful valley of Gokyo or other mountain passes in the region along with the visit to Everest Base Camp. This increases the length of the trek even further. You will cover a total distance of 130 km round trip from Lukla during your Everest Base Camp Trek. You will hike 65 km to Everest Base Camp with a proper amount of acclimatization time. Trekking to the Everest Base Camp is almost impossible without acclimatization and rest day. So, the time interval to reach the Everest Base Camp takes longer. Hiking 65 km each way might seem terrifying but that is not the case. You will cover a total distance of about 15 km each day through your trek to Everest Base Camp trek. Walking 15km is a comfortable and achievable number to accomplish. The walking speed of a normal person is 5 km per hour in the Everest Base Camp trek. So, an average person will feel the effects of the long and exhausting hike. Experienced trekkers will find the trek moderate as their stamina would comfortably cover 5 to 7 hours in the mountains. To make the hike easier for you, porters will carry the heavy luggage for you to the destination. So, you can focus on the trail and enjoy a safe hike to Everest Base Camp and back down the trail. You will hike 15 km each day for 9 days on a standard 14-day trek to Everest Base Camp. The 15-kilometer walk may not seem long to you but the rocky and steep terrains will slow you down. Gradual ascent to the higher altitudes need time to adapt and the snow-covered trails will also cause difficulties and slow down the trek. Everest Base Camp trek is suitable for people of all age groups and can be completed by 12, 13, 14 or more days. The trekking duration and the distance covered will depend on your physical strength and durability. You can always extend or shorten the duration of the trek according to your preference. The average trekking length of the Everest Base Camp trek is 14 days. However, the trekking routes from Jiri to Everest Base Camp and Gokyo lakes trek will take longer days than the traditional Everest Base Camp trek. You will reach the Everest Base Camp in around 9 days of and just 3 days to return back to Lukla. The 15km per day hike to the Everest Base Camp goes through many uphills and downhills. So, your body will feel a lot of pressure and exhaust after the hike. Trek routes like Jiri to Everest Base Camp covers the distance of 185 kilometers. So, you will need to have the ability to hike 4-5 hours per day to accomplish the trek expedition in scheduled time. Everest Base Camp Cho-La Pass-Gokyo trekking is also one of the popular trek option. 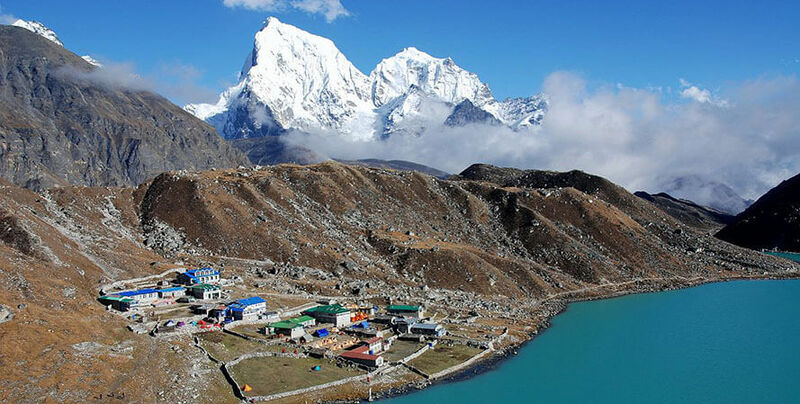 On this trek, you will have to walk additional 21 km from EBC to enjoy the mystic Gokyo lake. A scheduled training regime will prepare yours for the particular mountain trekking. Proper exercise routine will help build strength, stamina, and fitness. Aerobic exercise like jogging, swimming, and cycling will help you maintain your fitness level. With physical preparation to stimulate your performance, you can make comfortable ascent and descent to Mount Everest Base Camp. You also have an option to take a helicopter ride back to Lukla. The chartered scenic flight across the high mountain certainly makes your trek convenient and faster. The elevation is one of the most vital parts of the Everest Base Camp trek. You will start your trek at Lukla 2,800m and you will start to feel the effects of it on your body. Most of the people’s body is not used to the altitude above 2,800m. So, the Everest Base Camp trek will involve acclimatization days as the ascent continues for 15 km each day. With variation in altitude, you are prone to the symptoms of Altitude sickness. You will gain elevation gradually in the range of 400-800m each day. The highest point of the trek is Kala Patthar at an elevation of 5554m. Everest Base Camp is a high altitude trek for the distance of 65 km to the destination. So, you must slowly gain altitude with scheduled acclimatization day with sightseeing and exploration programme of the surrounding areas. It is a combination of dramatic trekking experience in the Everest region. The Everest Base Camp/Kalapathar trek offers you the carefully structured trek with limited day’s walk and gain in altitude. You will cover a total distance of 64 km on your one way hike to Kala Patthar 5554m. The trek features 6 km of hike each day to the Everest Base Camp and then to Kala Patthar. The trek begins from a lower altitude of Jiri. Jiri to Everest Base Camp trek follows the original classic trekking route to Everest base camp. You will have a steady adaptation to the increasing altitude as the time available on the trek is plenty for a slow ascent. The trekking distance from Everest base Camp and back Lukla is about 185 Kilometers / 115 miles. It is the shortest trekking expedition in the Everest region that start and end from Lukla. Everest Panorama Trek favors you, if you seek to witness the Immortal Mount Everest 8848m and other mountain ranges. The Trek heads towards the peaceful Tengboche monastery 3860m. The serene mountain views of peaks like Thamserku 6623m, Kwangde 6022m, Ama dablam 6812m, and Lhotse 8516 m is simply sublime. 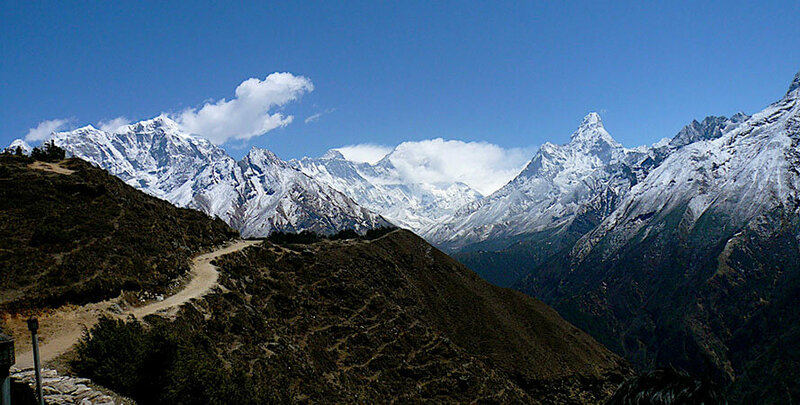 You will cover the total distance of 107 km on your Everest Panorama Trek. This is one of the most challenging and adventurous trek in the Everest region. The Everest Base Camp and Gokyo lake follows the usual routes to Base Camp.The trail leads further on the trek to magnificent Tengboche monastery before reaching the Everest Base Camp. You will soak in the icy wilderness sanctuary and hike through the Cho La Pass at 5330m to the summit of Kala Patthar. You will cover the distance of 10km each day on a total of 130 km trek to the Everest Base Camp – Gokyo Lake trek via Cho La Pass. 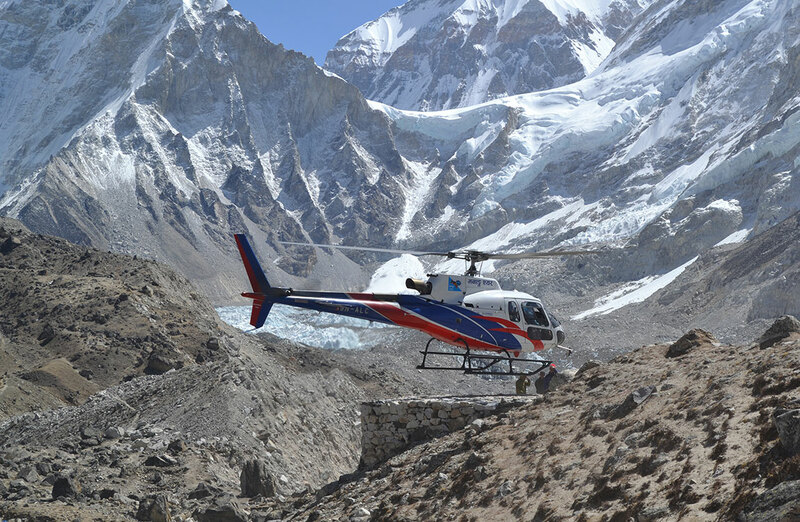 In the Everest Base Camp trek return from Helicopter, your trekking distance will be halved. You will take the conventional path to Everest Base Camp and Kala Patthar. During your descent, you will take a helicopter to Kathmandu. After you reach Kala Patthar during the trek, you will trek back to Gorak Shep. Then, you will take a helicopter from Gorak Shep directly to Kathmandu. So you will trek only 65 kilometers during your trek. The distance plays an important part in the Everest Base Camp trek. The time allocated for the trek depends on Distance, length and gradual and steady gain of altitude. Everest base Camp covers a long distance and takes a certain period of time to accomplish. So, you must plan strategically to complete the trek conveniently and easily.